Walk among Tasmania’s Tarkine wilderness, the largest tract of unbroken cool-temperate rainforest remaining in the Southern Hemisphere. This 65-million-year-old forest houses hidden gems and ancient relics including tree species that exist elsewhere only as fossils. We have designed the Tarkine Wilderness walks in order to unlock the beauty of the region that includes mountains, wild rivers, the sublime coastline with its ferocious oceans and iconic open plains. A real highlight of the trip is the boat journey down the Pieman River and then the walk out along the coast. As part of the Tasmanian Wilderness World Heritage Area, Cradle Mountain–Lake St Clair National Park is renowned for its glacier-sculpted mountain peaks, river gorges and icy streams cascading down rugged mountains, glacial lakes, tarns and tracts of wild alpine moorland. We get up close and personal to Cradle Mountain by walking a part of the iconic Overland Track, the Cradle Mountain Face Track and Dove Lake. Importantly on this 5-day journey, we remain immersed in the quiet wilderness as the accommodations are located right on the edge of these majestic parks. This holiday commences in Launceston at 8.00am. From here we will travel through Burnie to embark on our first walk at delightful Hellyer Gorge. Half of this region is rainforest, with the remainder being eucalypt forest, heathland, button grass and rivers. The Tarkine, reputed to produce some of the world’s freshest air, is so vastly inaccessible it takes a solid walk before you find the pure Sassafras rainforest, tree ferns and Myrtle trees, some which are over half-a-millennia old. We’ll enjoy lunch amidst some of Tasmania’s oldest forest environments before undertaking the last of the Tarkine walks for day one. This time we’re walking at the beautiful Philosophers Falls amidst the stunning towering Myrtle and Sassafras. Today we will get truly in tune with our surroundings as we set off following the narrow Whyte River forest track as it meanders beside the Pieman and Whyte Rivers. If we’re lucky we may even encounter a platypus out feeding in the river. Next, it’s on to the Mt Donaldson walk. The ascent should take us right up to lunch which will be enjoyed at the summit whilst taking in a spectacular view into the heart of the Tarkine. We will make our way back down to explore another of the Tarkine walks, a section of giant Myrtle trees along the banks of the Savage River. You will feel as though you’re wandering around on the set of ‘Lord of the Rings’ on these Tarkine wilderness walks. 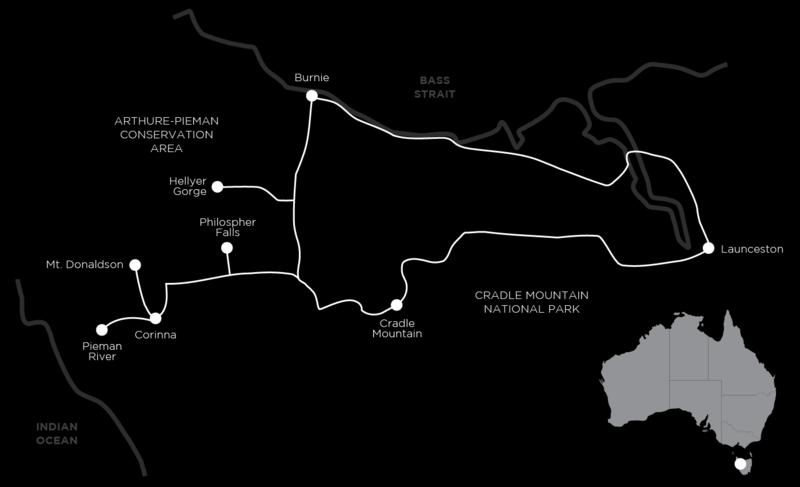 This morning we will take the historic Huon Pine Launch, Arcadia II, from Corinna down the Pieman River to the Pieman Heads, the last of our tarkine wilderness walks. The skipper will give very interesting commentary covering the history of Huon Pine harvesting, mining and thylacine before we disembark at the heads. The walking today is along the coast on beach and dunes. We will be treated to coastal flora and much evidence of indigenous middens. We start our final day in the Cradle Valley on a simply stunning three-hour walk into Dove Canyon. This encapsulates the variety of landscapes you would expect to find in the Tasmanian sub-alpine environment. Rest assured, there will be shorter and less strenuous walk options available today. We will leave Cradle Mountain around midday to make our way back to Launceston, stopping en route for lunch. Expect to get back to Launceston at approximately 4.30pm. The tracks have some rugged bits at Cradle, but other than that, most tracks are well graded and easy to negotiate. Full day walks average about 12.5km. There are great opportunities for really fit walkers to challenge themselves on two of the days. For the first three nights at Corinna we have private rooms but shared bathroom facilities in 2 bedroom cabins. On our last night we stay at 4.5-star Cradle Mountain Hotel right up against the park, in rooms with ensuites. The accommodations are all in beautiful locations, providing a further opportunity to walk and explore but are also great places to just sit and relax and take everything in. All the two course dinners are prepared by professional chefs in the accommodation restaurants. Enjoy some of the best local produce this country has to offer with an emphasis on Tasmanian local produce. Start each day with a substantial cooked breakfast to ready yourself for the upcoming walk. The packed lunches and picnics complete the circle ensuring that your appetite is always satisfied. A walkers lunch may include a high protein type salad, a roll or a wrap, a muesli bar, a piece cake or a muffin and a piece of fruit. Each day is slightly different. Lunch is always augmented by Auswalk’s trail mix. You can look forward to having lunch on a daily basis at some of the most beautiful remote locations in Tasmania. Tracks range from well-cared-for to less kempt, but they are all easily passable and are mostly dry and firm this time of year. However, on the odd occasion we have encountered wet portions of track. Most of the walks are easy to moderate. The easier alternative walks are great for first timers. Some walks involve challenging walking of between 5 to 7 hours each day with some steep ascents and descents, so the experienced hikers won’t be disappointed. This trip operates with two professional and experienced guides, knowledgeable of the area and natural surroundings, including the local fauna, flora and history. Thus easier and more challenging options will be offered each day. Pre and post tour accommodation: There are many good hotels in Launceston, however we pick up and drop off from two central hotels. The tour starts at 8.00am at the Colonial Motor Inn, 31 Elizabeth St in Launceston. Expect to get back to Launceston at approximately 4.30pm. Tasmania is best for walking in the warmer months, between November and April.